The property is a 10-minute walk to Terminal 21 Shopping Mall. It is a 20-minute drive to Central World Department Store and a 25-minute drive to Siam Paragon Shopping Centre. Suvarnabhumi Airport is a 1 hr drive away. Non-smoking rooms at Baan Sukhumvit 18 are furnished with contemporary Thai decor. Each comfortable room is equipped with a cable TV, a DVD player and a safety deposit box. A minibar and an electric kettle are included. A hairdryer and slippers come with an en suite bathroom. For convenience, the hotel offers laundry service and luggage storage. Safety deposit boxes are available at the front desk. Guests can enjoy views of the city at the rooftop terrace. A great variety of dining options can be found within a 10-minute walk from the hotel. 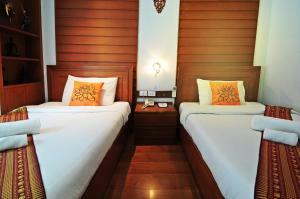 Air-conditioned room is equipped with a cable TV, a DVD player and a safety deposit box. A minibar and an electric kettle are included. A bathtub, a hairdryer and slippers come with an en suite bathroom. Air-conditioned room is equipped with a cable TV, a DVD player and a safety deposit box. A minibar and an electric kettle are included. A hairdryer and slippers come with an en suite bathroom. Rate: THB 1870.00 ... THB 2200.00; select dates below to get current rates. Rate: THB 1870.00 ... THB 2134.00; select dates below to get current rates.